I have been working on this quilt for so long, I don't remember when I started it. The original progress photos were among those that I lost a few months ago when I had a computer back up problem. But here it is and I am so pleased with the way it turned out. I bought the chintz fabric in Amsterdam, shortly after I started quilting, in 2003. I used 3 colors of linen and 4 colors of Kona solids to complete this quilt. It is made up of 144-6" squares, 117-5" circles (thanks to the Go! Cutter, they were a breeze to cut). The quilt should have finished at 72" square. After laundering, it measures 66"x68". It really shrunk a lot! I wanted to incorporate one of the selvages in the label since it says the store name/manufacturer on it and the city it was purchased in, "A*M*S*T*E*R*D*A*M". I just added my name and date to the selvage, with a permanent marker, cut out some little circles of each fabric and a unique label was created. Curry, Cheddar, Palm and Windsor Kona cottons were used to make the binding. it's really not sewn on this crooked! I really like the backing fabric. I thought it went well with the chintz. It is Essential 110" Cynthia Coulter for Wilmington Prints. I wouldn't call this a "modern quilt" but I still like it. It has special meaning because we purchased the fabric on vacation and also because it is the first quilt I ever did Quilt as You Go. I think it just might be a perfect size for a picnic quilt. I entered this in the "summer fair" AnneMarie is hosting at Gen X Quilters. Hop on over to see all the other entries. That is such a neat idea for the label! I agree, I think it would make a great picnic quilt! Gorgeous! I love circles but haven't worked up the nerve to try one yet. Your label is so clever! Oh I hope it wins. It deserves to - it is too too gorgeous. Can you tell that I love everything about it? Great quilt! I love that you added the selvage on the back. The quilt tells a story! Very pretty. The circles are great. Fab quilt - I have been to Den Haan and Wagenmakers too - the price of the fabric made my eyes water! I'd call it a modern quilt, and I think it is beautiful! Adorable label idea!!! Love it! Circles are on my radar of 'things to do'. Yours are great! Love your circle quilt. I've always wanted to make one but didn't know how to quilt it. You have given me an idea! Thanks for sharing. This quilt is so beautiful and I remember seeing the earlier photos1 Also your idea for the label is so great and unique! A plus job! The circles are so fun. Wow, what a beautiful quilt!!! Definitely a winner! Great label! Maybe you could play "Twister" on it too! Love circles, what a great quilt to take on a picnic. The label is a nice touch. from the tiny photo, i thought it was a 'circles in a square' crochet rug. the quilt i perfect! Whoope! Whoop! Love your circle quilt. I think it makes those fabrics look quite modern, actually. The circles, the boldness . . are too contemporary to be not modern. Wow, I think it is a neat quilt and modern looking, cute label. It sure doesn't look like a Quilt as you Go quilt! Great finish. Love the quilt and that is such a grat idea for the label! I love your quilt! What a great vacation memory - good call on using the selvedge as part of your inspired label. THis is so cool! Great picnic quilt. What a great quilt, Di! I love buying fabric on vacation and using it in a quilt - it gives me a tangible and useful reminder of the trip! Love your label, too - very creative! Whoop whoop!! Whoop Whoop! Great design and that it holds such a special meaning for you is awesome! Great job on your Amsterdam quilt. 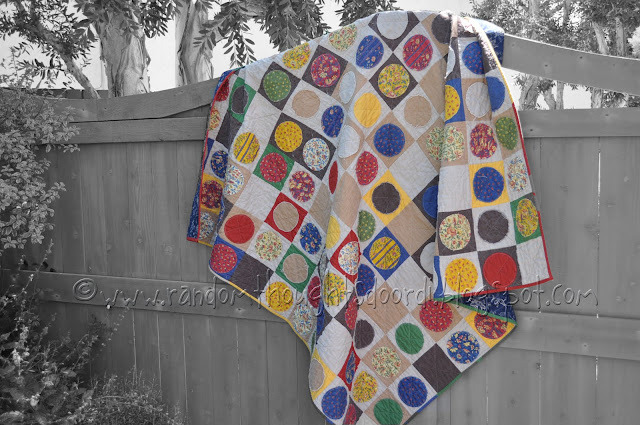 I want to put circles on my quilt bucket list.